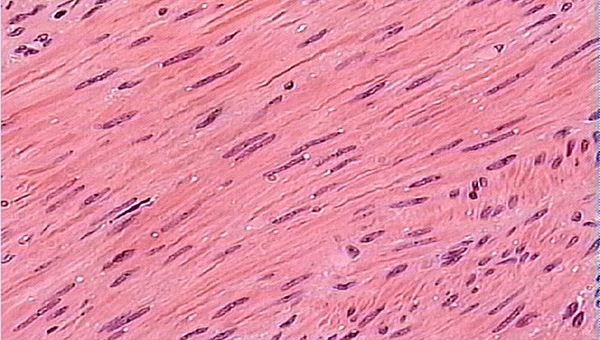 Smooth muscle is one of the three types of muscle found in the body. The other two types are skeletal muscle and cardiac muscle. This type of muscle is not striated like the other two types. It is an involuntary muscle so you don’t have any control over its contractions. The contractions are automatic responses to things like light, ingested food, and blood flowing through the body. It can be found in multiple body organs like the iris of the eye where it expands and contracts the pupil according to light exposure. In the arteries and veins it lines the walls and subtly contracts to push blood through the vessels. The walls of the esophagus and digestive tracts have smooth muscle which gently pushes food along through contractions called peristalsis.